The Computational Molecular Science (CMS) Group has been established within the Molecular and Electronic Nanostructures research theme at Beckman. Yang Zhang, a professor of nuclear, plasma, and radiological engineering, is named the founding group leader. Understanding various chemical reactions and transport phenomena from the molecular and electronic level; designing new synthetic pathways for radical forms of materials and medicines; characterizing and rationalizing the behavior of matter far away from equilibrium -- these are just a few of the grand scientific and engineering challenges that the newest research group in the Beckman Institute aims to tackle. The Computational Molecular Science (CMS) Group has been established within the Molecular and Electronic Nanostructures research theme at the Beckman. Yang Zhang, a professor of nuclear, plasma, and radiological engineering, is the founding group leader. By bringing together various research efforts across campus and leveraging outstanding resources at Illinois, such as the Computational Science and Engineering (CSE) program and the National Center for Supercomputing Applications (NCSA), the group plans to lead large-scale research efforts in the area of computational molecular science that would be beyond the capability of an individual research group. Along with Zhang, the other nine faculty members of the group include Narayana Aluru, of the Department of Mechanical Science and Engineering; Paul Braun, Andrew Ferguson, and Kenneth Schweizer, of the Department of Materials Science and Engineering; Martin Gruebele, So Hirata, Nancy Makri, of the Department of Chemistry; and Charles Schroeder and Charles Sing, of the Department of Chemical and Biomolecular Engineering. “Our goal is to consolidate campus-wide expertise on computational molecular science to facilitate interdisciplinary research in several strategic areas at the Beckman Institute and Illinois, and eventually establish a world-leading thrust in the frontier of theory-driven computational molecular science,” said Zhang. CMS is profoundly interdisciplinary. It embodies physics, which underpins the underlying fundamental principles; chemistry, which both explores higher-level emergent principles and creates novel synthetic routes of remarkable organic, inorganic, bio-molecular building blocks that can self-assemble to structures with unique properties; and molecular biology and medical science, which are imperative to improve our health and quality of life. “This group is an intellectual powerhouse with ambitious aspirations to advance important problems in molecular design thinking. Their activities cut across a number of experimental projects in the institute and so, wisely, the new CMS group integrated key experimentalists into its faculty roster,” said Jeff Moore, director of the Beckman Institute. The research topics of the CMS group include first-principle and semi-empirical methods, large-scale molecular dynamics simulations, advanced rare event sampling techniques, intelligent coarse graining and dimensionality reduction, and big data analysis -- all targeted to advance molecular science. The impact of the work is amplified through close collaborations with experimentalists, synthetic chemists, materials scientists, and engineers. 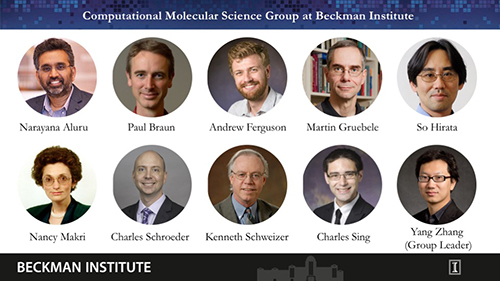 The CMS group will synergistically collaborate with other groups, such as the Theoretical and Computational Biophysics and the Autonomous Materials Systems groups, at the Beckman Institute. Find more on the Computational Molecular Science Group.